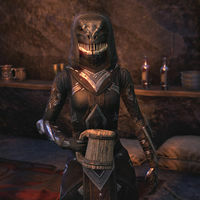 Remains-Silent, also known as The Bequeather, is an Argonian member of the Dark Brotherhood who serves as a shadowy supplier. She can provide you with various helpful supplies once you unlock the Shadowy Supplier skill. True to her name, she never speaks. Once the relevant skill is unlocked, Remains-Silent appears in the Dark Brotherhood Sanctuary, every Outlaws Refuge across Tamriel, and the Thieves Den in Abah's Landing, and is marked on the local map by the Dark Brotherhood symbol. Once every twenty hours you can pick one of three dialogue options, each yielding a container or item. An Assassin's Potion Kit, containing 5 samples of a Rogue's Potion. An Unmarked Sack, containing a Monk's Disguise. random item from the Sithis' Touch set. This page was last modified on 20 March 2019, at 01:23.